Wayne Dalton’s Thermospan® 150 Sectional Doors are manufactured using our patented, continuous foamed-in-place technology, in which the polyurethane core is securely bonded to hot-dipped galvanized inner and outer skins. This process gives the Thermospan 150 outstanding thermal, strength, and bonding characteristics while creating a door that is significantly more efficient than conventional insulated steel doors. 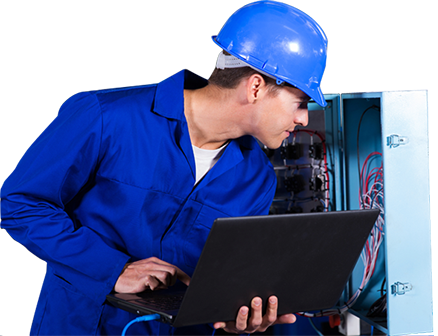 A designed-in joint seal also helps save energy by preventing air filtration. Optional factory glazed windows and aluminum full view panels, combined with three standard finishes (white, brown and tan), help ensure that the Thermospan® 150 meets your aesthetic requirements as well. The Thermospan® 150 is designed for easy installation, rugged durability and longer life. 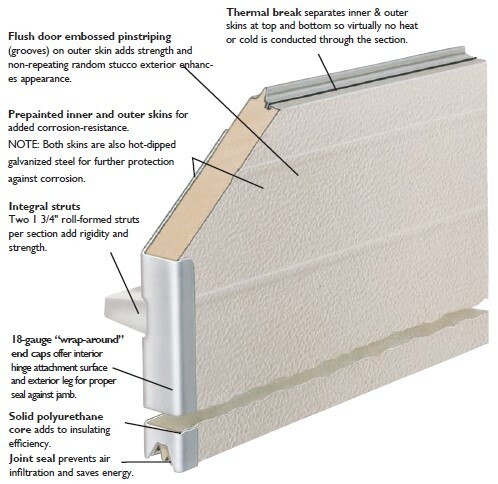 Features such as 18-gauge steel end caps and two 13⁄4″ roll-formed struts on each section give the Thermospan® 150 increased rigidity, while the factory finished interior and exterior hot-dipped, galvanized skins make installation easier, add life to the door and provide greater durability. The Thermospan® 150 also features hardware plates at all fastener points to add durability and extend the life of the door. This commercial door model is available with the TruChoice™ Color System. Wayne Dalton’s custom painting process that offers more than 6,000+ colours.